Singapore is well known for its hospitality towards the dreary folk who spend arduous hours of work either at their jobs or at school. Killing time in Singapore is made easy by the fact there is just so much liveliness to choose from. Bars are the optimal choice for most people on working days considering it is an easy and liable way to just lay back and relax for several hours. A lifestyle trend consisting of pubs and bars was on the rise in Singapore as many people began to get used to it, this resulted in a buildup of bars across many regions in Singapore, and the bars maintained certain themes and attracted specific people to their confines. Relaxing with a few drinks while chatting away with other customers while enjoying hip music are some of the pleasures of being in a bar which are found not to be scarce in Singapore anymore; Of course because of the substantial array of choices, people become choosy in regards to what bars they visit. The East Coast Park is probably the best choice for anyone who wants to just kick back and enjoy a few rounds of drinks with their friends. 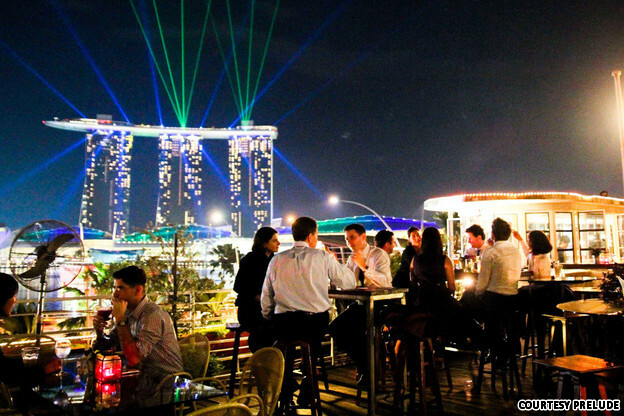 The South Eastern part of Singapore has a vast variety of bars to choose from running alongside the shoreline. The bars are very hard to miss as they appear every few yards or so, which means you should not have a hard time choosing. The hospitality of these bars also includes indulgences in food, so don’t fret your stomach won’t go empty. You would not find it hard to choose where you want to drink and eat considering the multitude of bars at the beach. Nevertheless if getting to the beach is out of the question, you can find numerous bars in the Business District too. Close to the Singapore River you can find bars which provide the same experience of relaxation as offered by the bars at the beach. As if that wasn’t enough there are numerous bars on the Arab Street which cater traditional Hookah smoking with alcohol and food. The view from the skyscrapers at the rooftop bars into the mainland of Singapore is truly a sight to behold while you enjoy a period of relaxation, drinking and eating leisurely alongside your friends. Excluding all the hangout bars, nightclubs offer a viable substitute which offers the same services as a bar except with the addition of the loud thumping music. The nightclub craze in Singapore is rampant, as gigantic lines can be seen stretching all the way to the main streets on a weekend. Nightclubs cater to specific people, sort of in the same manner as bars do, they have adapted over time to be able to serve specific age groups and classes. From the elderly to even university students, nightclubs have everything to offer to anyone they choose. Dancing away to catchy beats and thumping bass is an effective way of winning the battle against stress; the best way to ease your’ mind. However if one wants to simply enjoy a chat with his buddies Singapore is full of night time pubs as well. Pubs work in the same way as bars do. Similar to the hang out bars, these pubs provide an ambient aura for leisure and relaxation with their soothing music. The saying that time is of the essence does not apply to Singapore, you can have all the time in the world, yet you’d never run out of pubs, or bars to hangout in Singapore. Remember that bars are a great place to meet new people and to chill with your friends while you relax and have a great time.